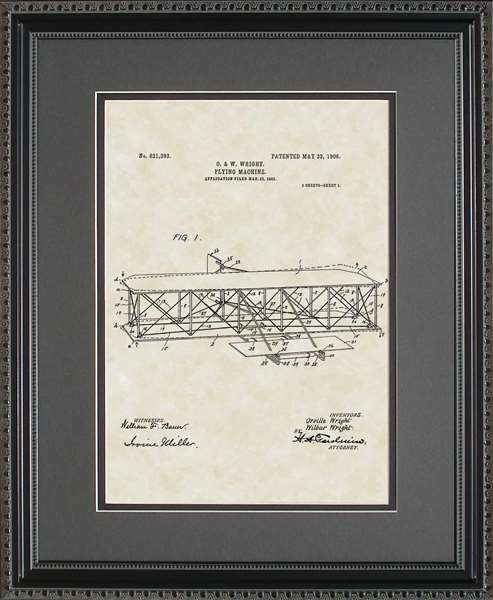 The Wright brothers wrote their 1903 patent application themselves, but it was rejected. In January 1904 they hired Ohio patent attorney Henry Toulmin, and in 1906, they were granted this patent. 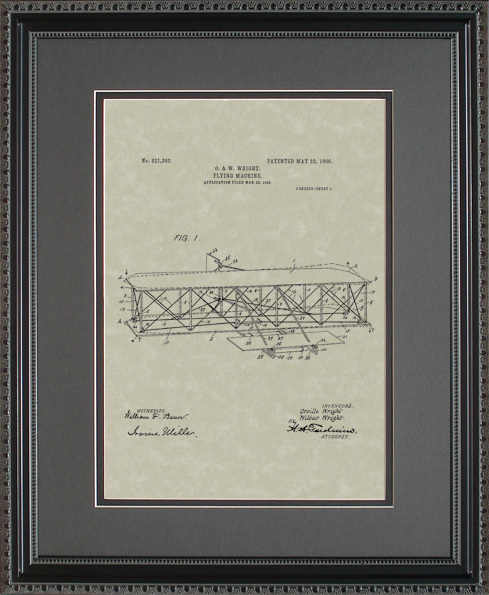 The patent illustrates a non-powered flying machine, the 1902 glider. The patent's importance lies in its claim of a new and useful method of controlling a flying machine, powered or not. The patent describes the steerable rear vertical rudder and its innovative use in combination with wing-warping, enabling the airplane to make a coordinated turn, a technique that prevents hazardous adverse yaw, the problem Wilbur had when trying to turn his 1901 glider. Finally, the patent describes the forward elevator, used for ascending and descending. 11x14 both image size and overall size is 11" x 14"
11x14: image size is 7" x 10" & overall frame size is 13-1/4" x 16-1/4"
16x20: image size is 12" x 16" & overall frame size is 18-1/4" x 22-1/4"
Great gift for the pilot, aircraft mechanic, or airplane hobbyist. Reproduction of the original patent artwork and application submitted to the US Patent Office. This turned out to be the perfect, unique gift I had been looking for. Beautifully framed and the personalization was equally as nice. I received it two days after I ordered it, which was amazing.